:Explore Faith That Sticks books?filled with fun-to-read stories and activities that teach children about God while they are learning to read. Faith That Sticks books include stickers, discussion questions, and other activities designed to bring enjoyment and deepened learning experiences for kids. 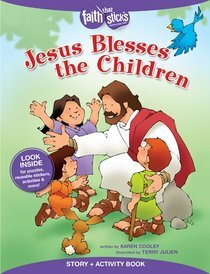 Children discover just how much Jesus loves them and wants to bless them in this favorite Bible story. The story of Jesus welcoming the children after the disciples wanted to send them away reminds everyone how much Jesus wants them near Him. About "Jesus Blesses the Children (Incl. Stickers & Puzzles) (Faith That Sticks Story & Activity Book Series)"